There is surety for keeping Metadata info as it is while migrating emails from EML files into MSG. This won’t affect metadata info details such as To, Cc, BCC, Sent/Received Date and so on. Thus migration is complete successful as data change is not a chance at all. Software is supportive of all MS® Outlook editions. This includes editions such as 2007, 2003, 2013, 2010 and so on. Because of support to all the Outlook versions, users can perform data migration without caring about specific Outlook edition. Sysessential for EML to MSG Converter supports saving emails into separate folder which you have generated for making data export. The application supports for separate folder will help users are required to access emails later and wanted to use them further. The application is supportive of keeping folder structure as it is even after data migration. The folders containing EML files simply converted into MSG files and moved and that too without causing any changes to folder structure. Folder hierarchy also continues to be same after data migration. Just like it supports all Outlook editions, software is comfortable to work with all the Windows OS versions. 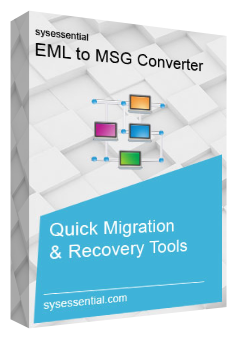 You will be utterly comfortable when it is to convert EML files into MSG for Windows users. What are the Windows versions where software is able to work? Software is able to work comfortably with all the Windows OS editions. It is compatible working with NT, ME, Win7 and lots more. Is software helpful for less technical user? Will it produce equivalent results? Sysessential for EML to MSG Converter is extremely easy to operate application even when advanced technologies are added to it. Install and run the tool and after that tool will start processing. It will produce beneficial and equivalent results even when you are not technically much strong. How free demo version really helps? If you wanted to diagnose the working of the tool of if you are in need to catch the working process then download the software in free demonstration edition. You can test the features and working process both by simply downloading free demo edition. The demo will convert first 1o emails of every item from EML files into MSG file format. How software works when you have bulk data to export? If there is bulk data to move from EML into MSG file format then not to worry, software will be able to move data safely. Being powerful, it supports for converting bulk EML files. It also supports converting few selected emails into MSG file as well. When I got the chance to convert EML files into MSG file format then I trusted using Sysessential for EML to MSG Converter and this leads to produce effective results. After fulfilling purchase formality, I got the application and made bulk email conversion from EML onto MSG. It is trustworthy and long-term running application when there are bulk emails to be migrated into MSG file format.